This really needs to be read with Dr. Strange: Damnation to get the fullest enjoyment out of it. Dr. Strange brought back Las Vegas and Hell followed with it. (Las Vegas was destroyed in that Secret Empire nonsense.) Memphisto takes his soul and Strange has to team up with the Avengers to stop him. Niko Henrichon isn't really ready for the big time yet on art. He's got a less defined Michael Kaluta look to his art but uses WAY too much black ink and draws huge doe eyes on all his characters. Fra This really needs to be read with Dr. Strange: Damnation to get the fullest enjoyment out of it. Dr. 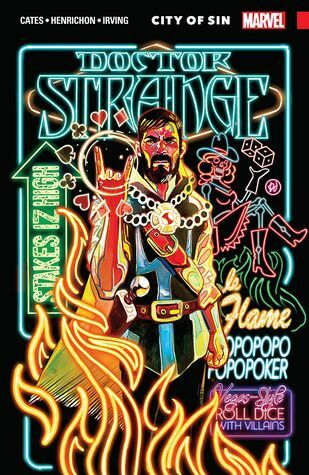 Strange brought back Las Vegas and Hell followed with it. (Las Vegas was destroyed in that Secret Empire nonsense.) Memphisto takes his soul and Strange has to team up with the Avengers to stop him. Niko Henrichon isn't really ready for the big time yet on art. He's got a less defined Michael Kaluta look to his art but uses WAY too much black ink and draws huge doe eyes on all his characters. Frasier Irving is much better on the last issue. The last issue with Spider-Man may be my favorite comic of the year. After reading this, I'd love to see Cates on a Spidey title. He definitely has an ear for dialogue. That conversation between Spider-Man and Dr. Strange is magical and then when Spider-Man talked to the spider, I nearly busted a gut. Most of my review is in my damnation review. This volume is basically all of that. So it's about Mephisto bringing hell on earth and strange stopping it. So go read that review to see what I thought. For the last issue, which is NOT in Damnation collection, this is the final issue Donny Cates writes and honestly it's his best one. It's a bitter sweet goodbye, giving us some great human moments with Strange. However, it's the Spider-man moments that make this issue fantastic. Peter and Strange's Most of my review is in my damnation review. This volume is basically all of that. So it's about Mephisto bringing hell on earth and strange stopping it. So go read that review to see what I thought. For the last issue, which is NOT in Damnation collection, this is the final issue Donny Cates writes and honestly it's his best one. It's a bitter sweet goodbye, giving us some great human moments with Strange. However, it's the Spider-man moments that make this issue fantastic. Peter and Strange's friendship is interesting, unique, and a lot of fun. This is both a funny issue and a sad one because you want Donny to stay on Strange once it's over. But for what it is, this two volume run was very solid and for that alone I'm pushing this to the same rating as volume 1. A 4 out of 5. Peter Parker's face when Strange asks him if he wants to be able to talk to spiders is worth all of the stars. Probably not the strongest of stories. I felt like the previous damnation novel was better in a way. Still good fun. Interesting to see where they take it next. Definitely smell a reboot coming on. The bad thing about this volume is it intertwines with another title (also written by Cates). The good thing is he did a nice job of filling you in if you haven't read it. Love the tone of this. It reminds me of Fraction's Hawkeye mini-series. Strange clearly has his own issues, and like the best Marvel characters, he's human, and makes mistakes. There's a snarky attitude about the whole thing, so it's a little bit funny, usually at the expense of Stephen, which just makes him even more relatabl The bad thing about this volume is it intertwines with another title (also written by Cates). The good thing is he did a nice job of filling you in if you haven't read it. Love the tone of this. It reminds me of Fraction's Hawkeye mini-series. Strange clearly has his own issues, and like the best Marvel characters, he's human, and makes mistakes. There's a snarky attitude about the whole thing, so it's a little bit funny, usually at the expense of Stephen, which just makes him even more relatable and not this stoic, all-power and all-knowing super magician that never makes a mistake. The art isn't bad, a little "scratchy" looking and sort of fits. It's David Aja-ish, again, like Fraction's Hawkeye. Hopefully the upcoming hardcover collection for Cates' run will have both series in reading order. I feel like there is a good story here but, and I hate to say this, the art is so bad I kept being confused as to what was happening. I started reading this and immediately felt like I'd missed a volume somehow EVEN THOUGH this is VOLUME 2 and I just read VOLUME 1 recently, but I guess this comes after Doctor Strange: Damnation because UGH WHY WOULDN'T IT, COMICS?! Anyway so that was confusing but I just did a quick Wiki dive in the middle of my reading experience and got through it. 2 stars for general confusion, a BILLION stars for the final issue featuring Peter Parker and a literal spider. Average of 3 stars. It's mystic m I started reading this and immediately felt like I'd missed a volume somehow EVEN THOUGH this is VOLUME 2 and I just read VOLUME 1 recently, but I guess this comes after Doctor Strange: Damnation because UGH WHY WOULDN'T IT, COMICS?! Anyway so that was confusing but I just did a quick Wiki dive in the middle of my reading experience and got through it. 2 stars for general confusion, a BILLION stars for the final issue featuring Peter Parker and a literal spider. Average of 3 stars. It's mystic math, don't worry about it. Donny Cates, you did this right. Niko Henrichon and Donny Cates... beautiful combo. I love Niko's work, and this is no exception. This Volume runs parallel to the Damnation event, but it's still able to be understood, for the most part. After the events of Secret Empire, Las Vegas is still a disaster area after the Hydra attacks. Strange, seemingly ignoring the cost of magic, but vigilant anyways, goes to the site, and thoroughly resurrects not only the entire city, but all the people who were in it. However, something else comes back with everything, something Strange did not want to see: Hotel Inferno, a demonically infl This Volume runs parallel to the Damnation event, but it's still able to be understood, for the most part. After the events of Secret Empire, Las Vegas is still a disaster area after the Hydra attacks. Strange, seemingly ignoring the cost of magic, but vigilant anyways, goes to the site, and thoroughly resurrects not only the entire city, but all the people who were in it. However, something else comes back with everything, something Strange did not want to see: Hotel Inferno, a demonically influenced hotel run by Mephisto. The devil is claiming that the souls were all his already, but with resurrection, he has lost them. Enter a high-stakes card game between the two of them. Winner takes all! When Strange is caught cheating at the game, he is beaten and captured. Wong contacts him and tells him that the Midnight Sons (Blade, Doctor Voodoo, Elsa Bloodstone, Ghost Rider, Iron Fist, and Man-Thing) are on the way to rescue him. They can't get to him, so Clea, Loki and Scarlet Witch come to free him. The city is being influenced by hell and people are turning demonic, including several of the Avengers, who appear to have a head much like Ghost Rider. The battle is heavy, and Strange loses his body to Mephisto as well. But all is not lost... all the possessed people's spirits are in the Realm Between. Strange gathers the team up, and through a double cross against Dormammu, Strange saves the day (though apparently, this scene is in the main Damnation title, which I need to read soon!) The final issue in this Volume brings back Zelma and covers the two of them addressing the drama that has been building for a while. Do they end up together? No, but the friendship is at least rekindled. This title will launch again with Volume 1 soon. What's next for the Sorcerer Supreme? Recommend. This review has been hidden because it contains spoilers. To view it, click here. Solid read. A bit more supernatural than I like, but it's Doctor Strange, so what do I expect, right? I really liked watching Strange evolve--and finally really face all the problems he's had in the past year and move beyond them (at least, by this graphic novel's end). Bats (the ghost dog) was definitely my favorite part of this story. His straightforward attitude was the perfect foil for Doctor Strange's brooding. This story also had some solid twists and turns, and it's got me curious to read Solid read. A bit more supernatural than I like, but it's Doctor Strange, so what do I expect, right? I really liked watching Strange evolve--and finally really face all the problems he's had in the past year and move beyond them (at least, by this graphic novel's end). Bats (the ghost dog) was definitely my favorite part of this story. His straightforward attitude was the perfect foil for Doctor Strange's brooding. This story also had some solid twists and turns, and it's got me curious to read that whole "Damnation" story arc... which is saying something, since I'm generally more of a DC fan. The best issue, however, was definitely the last one: Spider-Man's cameo was beyond hilarious. I forget why I loved Spider-Man growing up until he sneaks his way into a different comic, and then I'm like, "That's right! He's hilarious, relatable, and awesome!" The mini comic where he talked to a spider... that was some dark humor. But, man, if I wasn't chuckling through the whole thing! I'm glad that we finally got some closure with Zelma, as well. I liked her character, but I think it's also time to move beyond the drama and venture toward something else. Doctor Strange deserves a fresh start, and that's what I'm looking forward to in future comics starring the Sorcerer Supreme. But these last two graphic novels, headed by Donny Cates, were spectacular reads: funny at times, but also undeniably grounded with enough magic to keep your imagination spinning. Thank you, Cates. I look forward to seeing what you do with other titles in the future. You know what I love? I love when Marvel splits a single story among several series so that when you read a collected volume for one series, such as this one, you get - at best - half the story. Donny Cates does his level best to bridge the gaps with lots of blatant callbacks to off-camera events, so City of Sin isn't the worst version of this Marvel trope, but it's still a tough read. Essentially, Mephisto took over Las Vegas in Doctor Strange: Damnation and now Strange and the Avengers are figh You know what I love? I love when Marvel splits a single story among several series so that when you read a collected volume for one series, such as this one, you get - at best - half the story. Donny Cates does his level best to bridge the gaps with lots of blatant callbacks to off-camera events, so City of Sin isn't the worst version of this Marvel trope, but it's still a tough read. Essentially, Mephisto took over Las Vegas in Doctor Strange: Damnation and now Strange and the Avengers are fighting their way through multiple dimensions to kick hell off Earth. Everything is going surprisingly smoothly until round about issue four when an Editor's Note reveals that the actual conclusion to the story appears in Damnation. So, uh, sorry for leaving you hanging I guess? I like Cates' sense of humor - he does great things with Strange and Loki, as well as Strange and the ghost dog, Bats. And overall, this volume and the previous one are big and weird and pretty fun. I'll be sorry to see him leave the series. I mostly blame Marvel for the failures of this volume - why split a story into several series? Bad form. Brought down by the messiness of being in a crossover event. The cool ideas are in the event book. I liked all the parts with the ghost dog and the last issue that was not part of the event was fun. These issues could have easily been devoted to another story entirely and allow the Damnation book to stand on its own. Most of this will make no sense without the other issues in the Damnation cross-over (though some of those cross-overs are terrible) but the whole thing is redeemed by the final issue with Spider-Man. Terrific in tone and art. I think the thing that disappointed me the most in this volume, and why I gave it two stars, is that all but the last chapter was the Damnation arc. Why bother publishing the story arc separate when you're just going to include it in the next volume anyway? Great wrap up to a great run, with a happy ending! The Damnation arc was kind of all over the place, but that final issue with art by Frazer Irving was amazing and totally made me wish we had more Spidey/Doc Strange stuff. With this being tie in issues to another Dr. Strange event, at times one feels like they lack the full story. If you've read the Damnation mini-event, you've read all but one of these issues. The last is Cates's farewell to the series, and it's great. Damnation was a good event, too, for the record.